Healthcare industry evolves faster than you could expect. Latest healthtech solutions simplify doctors’ work, connect patients with physicians and allow them to live longer & healthier lives. Let’s explore the best healthtech apps that marked the year 2018. Elderly people are the most frequent visitors of hospitals. They usually turn to emergency departments, with the same specific complaints and, generally, take the most of doctors time. To avoid common organizational issues, the Leiden University Medical Center in Netherlands has developed the APOP screening app. 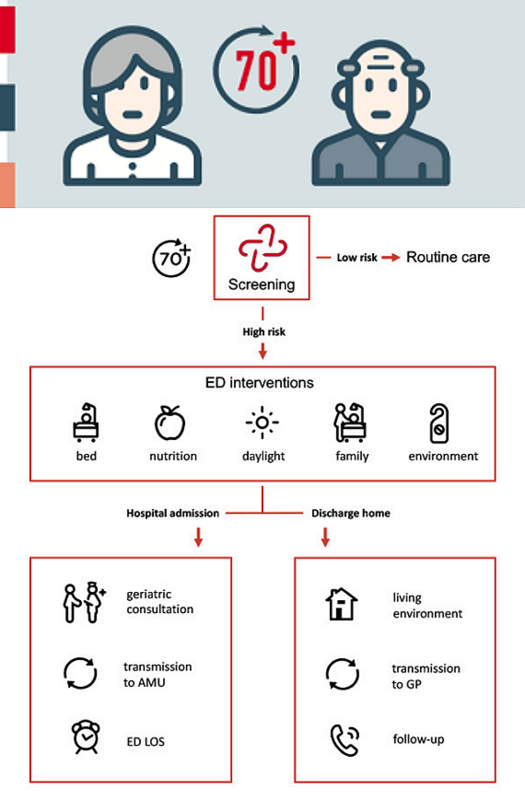 By using this healthtech app, ED professionals can quickly find out which patients are at high risk of negative outcomes/death within the next 3 months. There are 9 questions to answer to get the idea about patients’ mental/physical health. The other part of APOP healthtech app includes recommended interventions for each kind of patients that medical specialists can take into account to take better care of them. The app is available on most Android and iOS devices, and it’s completely free to download. Let us present you the blockchain-powered healthtech app which goes far beyond the options of ordinary fitness tracking solutions. Built by Canadian startup Eterly, it works as a personal coach, analyzing each user’s lifestyle on a daily basis. The AI chatbot gathers data about eating habits, vitamin intake, exercise routine in real time, calculating longevity score based on this data. Then, it creates a custom health & fitness routine, allowing you to improve the longevity predictions. By reaching precise goals, a user takes steps towards a healthier and longer life. The healthtech app is compatible with most smartphones & tablets on Android & iOS. Plus, it’s absolutely free to use. 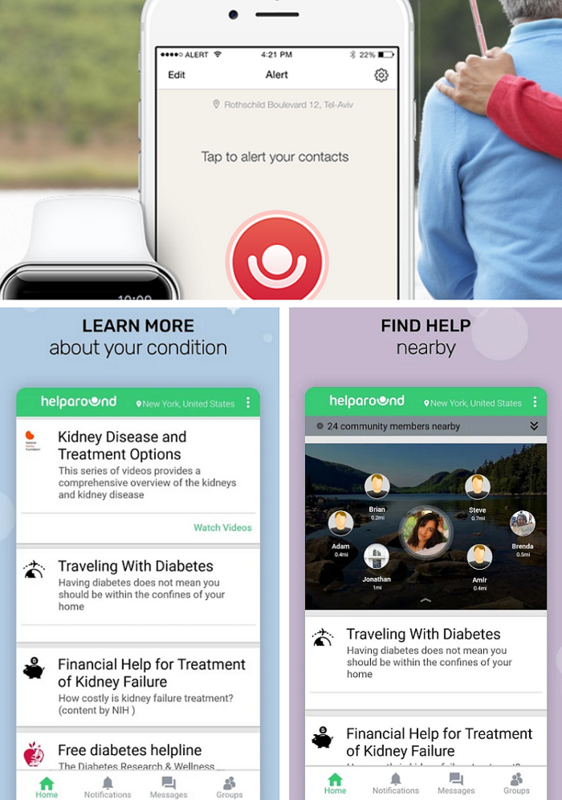 HelpAround is the first safety network for diabetics, which personalizes patient services through mobile devices. The AI-powered solution analyzes each user behavior, medical and demographical data to offer help when he/she needs it most. Connecting patients with their families, the iOS app provides instant help in emergency cases. A custom created function “Alert” for Apple Watch allows diabetes sufferers to send SMS to chosen users with their coordinates on Google Maps asking for help. Users can chat, get advice from other diabetics Besides, the solution includes the following options: carb counting, CGM, glucose management and insulin counting. At the moment, this healthtech app is widely used in the USA, EU countries, the UK and Israel. This health tracker app is already making a change from sick-care to healthcare treatment model. Created by RepleteHealth – a tech startup from India, it provides patients with instant access to all personal health data collected and stored in one place. This includes patient records, clinical & behavioral data, prescriptions, healthcare graphs & analytics. Based on AI and machine learning algorithms, the app learns behaviors & dietary habits, nudging patients to follow all instructions and tracking the outcomes. You can share any information with your doctors or family to keep them updated about the latest health status changes. 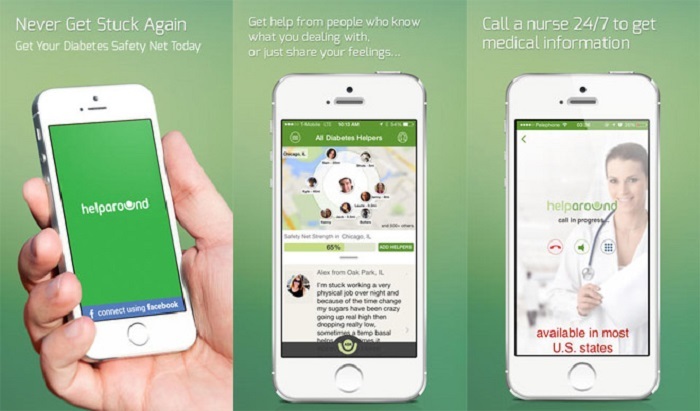 The unique healthtech app improves communication between care providers and patients, keeping track of each person’s treatment process. It is especially useful for treating chronic illnesses since it allows to cut costs on regular doctor visits. 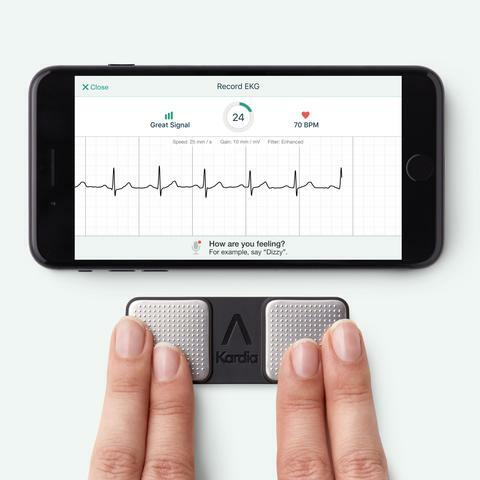 Kardia Mobile is a healthtech app providing medical-grade EKGs in real time. It remains one of the best healthtech solutions in 2018. By using this healthtech app, users can learn if their heart rhythm is normal or whether they have the atrial fibrillation. The app works together with a wireless EKG monitor which you can buy online. To activate the system, you should download the app on any smartphone or tablet and place it close to the EKG KardiaMobile monitor. All you have to do is put your fingers on electrodes and wait 30 seconds until the app generates EKG results. Leading cardiologists recommend Kardia App to record accurate data about heart conditions. This healthtech app saves patient time, efforts and money spent on going to hospital and doing EKG. The app will be useful both for doctors and patients, and it runs on Android and iOS devices. 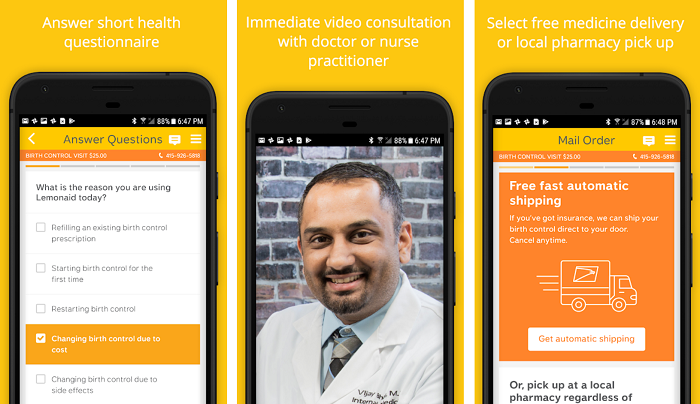 This healthtech solution by Icebreaker Health Inc from San Francisco is an innovative telemedicine mobile app for iOS and Android providing users with affordable online healthcare services. With the machine learning algorithms behind the scenes, Lemonaid Health provides evidence-based guidelines and improves patient experience. Mainly, it offers instant video consultations and a personalized treatment by board-certified doctors. Among other key options, a free medicine delivery should be mentioned. The app is great for patients suffering from acid reflux, flu, hair loss, and birth control problems. 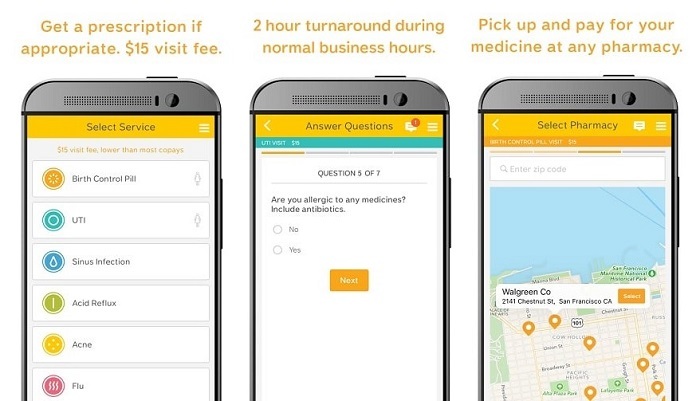 Since there is a shortage of medical experts in several US states, Lemonaid is a highly useful solution, delivering high-quality healthcare services to each and every client. To develop a healthtech mobile app that will benefit both the creator and its target audience, you need to carefully study the market and stay informed about the latest trends dominating it. In this article, we mentioned a few solutions to keep you informed and inspired for the new projects.